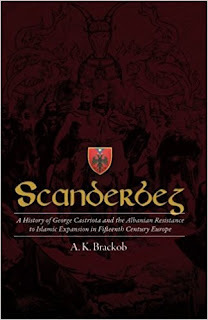 My pre-Christmas reading has been a new book on the Albanian hero Scanderbeg (or George Castriota) by A.K.Brackob, published by Histria Books. 2018 will be the 550th anniversary of Scanderbeg's death. It was by any standard an extraordinary life, and not well known outside Albania where his standard is the national flag to this day. From 1443 to 1468 he led the resistance to the Ottomans in Albania, at a time when they were the dominant military force in the Balkans. To understand his achievements you have to appreciate the geography of Albania and the author spends some time describing the mountains that protect the country's small coastal plain. It may also have been its weakness, as it meant the country was slow to create a more centralised feudal state that might have been able to unite to resist invasion. Internal division and Venetian administration in coastal ports, combined to weaken the defences. Scanderbeg himself was a hostage in Istanbul from an early age after his father's rebellion against the Ottomans. Albanian's have historically worn their religion lightly and the country had Catholic, Orthodox and Islamic adherents. Scanderbeg's father John Castriota, converted to Islam and regularly switched his religion depending on his current allies. The young George was a hostage in the court of Sultan Murad II and was educated in the palace school. 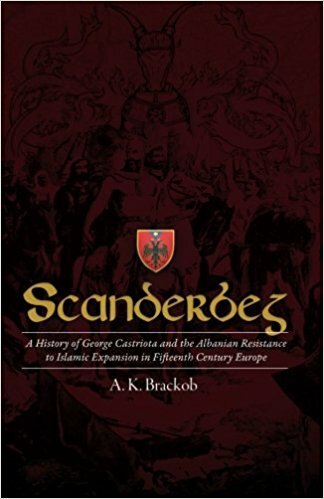 He later converted to Islam and took the name Scanderbeg. He probably gained military experience on campaigns with the Ottoman army in Anatolia and certainly remained loyal to the Sultan during his father's revolt in the 1430's. His elder brother served with the Venetian's. 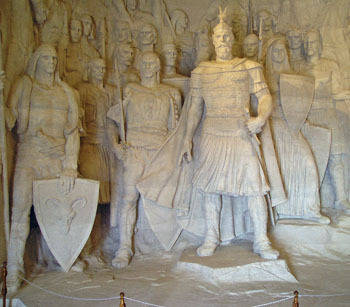 He was appointed the governor of important Albanian castles and began his preparations for revolt. 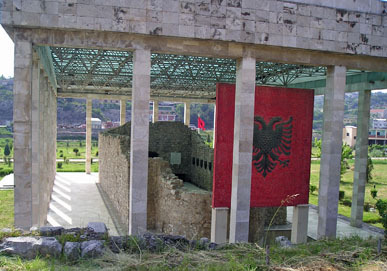 The Ottoman defeat at Nis in 1443 was the opportunity to return to Albania and capture, by ruse, the key castle of Kruje (Croya in the book) in central Albania. Abandoning Islam, he forged a loose alliance of the Albanian lords in central Albania in the League of Alessio, although his authority as general of the army was limited. The north remained under Venetian control and south largely remained loyal to the Ottomans, where the Timar system was in operation. Commanding a force that rarely exceeded 10,000 men, he fought a guerrilla war against the Ottomans, using the topography effectively. He defeated the Ottomans in battles at Torvioll and Otonete. The Venetian's became wary of his growing power and this led to war in in 1447. After Scanderbeg defeated them, a peace treaty was signed, although they continued to assist the Ottomans with supplies. Scanderbeg aimed to support John Hunyadi's invasion and was only some 20 miles from joining him at the second Battle of Kosovo. He survived the epic siege of Kruje in 1450 and received modest support from the Pope and other western states, particularly Naples. Although his power base at home was weakened by internal divisions. He survived these and defeated the Ottomans several times, even finding the time to lead an expedition in Italy in 1460 in support of Naples. Mehmed himself led a huge Ottoman army into Albania, but yet again failed to capture Kruje in 1466. He did capture other areas and devastated the country, which suffered serious depopulation. Scanderbeg died of malaria in January in 1468 while trying to put together yet another coalition. While some resistance continued, the Ottomans gradually extended their control over all of Albania. Scanderbeg is credited with holding back the Ottoman advance into Italy, which required an Albanian base. One of many admirers was the British General James Wolfe who wrote that he "excels all the officers, ancient and modern, in the conduct of a small defensive army". The author covers all of these events, with a fast paced narrative. He pulls together the limited sources as few have done since the classic history by Bishop Fan Noli in 1947. Although Harry Hodgkinson's 1999 book is also worth a read. You can't avoid the great man in any visit to Albania, not least in the main square in Tirana. 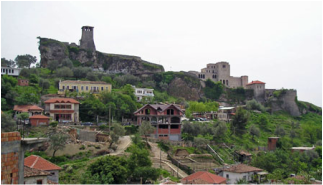 There is a fine museum in Kruje and the castle is well preserved as well. His tomb is in the cathedral ruins at Lezha. 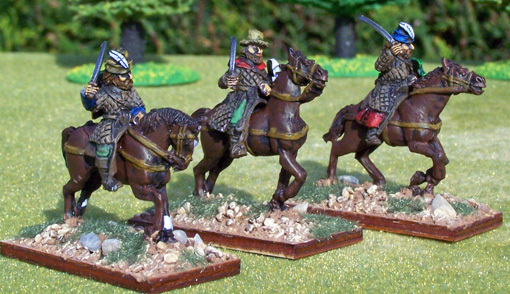 For the wargamer, this is a challenging medieval army to use, even with western allies. It requires the right terrain and tactics to make best use of the Albanian light horse. I have armies in 15mm and 28mm, but haven't won with them very often. Despite my reading, little of the great man's skill has brushed off on me!